Painting as a way of understanding the layers of the hidden world permeating every aspect of daily life. Layers of color, tone, taste, smell and touch describe Suzanne Moulton’s approach to manipulating liquid, fiber and pigment. Given access at an early age to mud, sticks, stones, paper, paints and pencils she roamed the woods of the Northeast learning directly from nature how to build, hunt and harvest. Her wanders put her in touch with a world overlooked by most, a private world teaming with activity. A wolf spider cleaning its tunnel with a quiet tap-tap-tapping, crawdads fanning algae with seemingly invisible hands and a waterspout dancing in eerie stillness upon a glassy lake, a green sky looming with the promise of winds to break trees dry of life. A small abandoned nest expertly woven from horse hair by the beak of a bird marked the beginning of a life long respect for the ingenuity and artistry, beyond pure survival, of the natural world. This environment created connections in her brain that blend the manifestation of sensations through any media... whether the medium be oil paint, blending herbs for healthy consumption or arranging stones on a beach, her work attempts meaningful layers of altered perception. In the last six years S.Moulton has focused her painting style to merge inspiration from Classical Flemish Trompe l'oeil with this wildlife awareness. Her love of misunderstood and marginalized animals dominates her subject matter, while concepts of surrealism play with historic mythos. Secret narratives and childhood dreams are bound in the objects cared for by these totem animals. 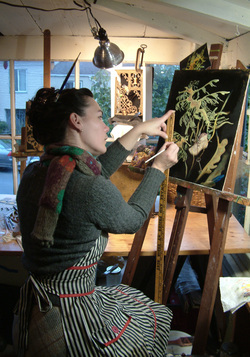 S.Moulton has studied archival and traditional methods of oil painting and incorporates her scientific knowledge of light, color and elements to create a unique illusion of depth. S.Moulton’s paintings and drawings have hung in the National Horse Racing Museum, The Hyde Collection, Kansas City Art Institute Permanent Traveling Collection, National Society of Illustrators New York, The Portland Art Center and The Coos Art Museum Expressions West 2005, 2009 and 2013. Additionally, S.Moulton has professionally designed rod puppets, theatrical sets, furniture, restaurant interiors, product branding and packaging. S.Moulton is an experienced Stop Motion Puppet Fabrication artist and hair/fur specialist, and has worked at Mackinnon & Saunders and Laika on films such as Frankenweenie and Coraline.